With the recent three million drop in subscription numbers, World of Warcraft forums are full of people thinking what could save the game from further decline. TheLazyPeon is one of them, and he compiled a list full of interesting ideas that’d fill the game with life again. Some of these idea always come up in forum discussions (just think about the idea of balancing PvP and PvE separately) and some of them are completely unexpected (naked PvP based on DayZ? What the hell?). Also, not sure about the casino or the theatre, but the video’s point that there is a call for a more social environment is clear enough. 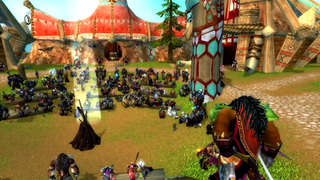 Scaling up the large battlegrounds Tol Barad and Wintergrasp for level 100? Hell yeah! More server events? Yes, sir! I loved things like the constant invasions of enemy faction cities back in Wrath of the Lich King. People were motivated to do it, because of the Black Bear mount reward. It’s not a video intended to fix the game. Blizzard’s good at that (and they actually listen to feedback). Just a few wild ideas that could make the social aspect of it much better.